Vancouver, BC - Skyharbour Resources Ltd.(TSX-V: SYH) (OTC Grey: SYHBF) (Frankfurt: SC1N) (the “Company”) is pleased to announce it has commenced a field program, in conjunction with project partner Clean Commodities Corp., consisting of an airborne electromagnetic (EM) and magnetic survey on the Preston Uranium Project, which is one of the largest tenure positions in the Patterson Lake (PLS) area totalling over 121,249 hectares (nearly 300,000 acres). 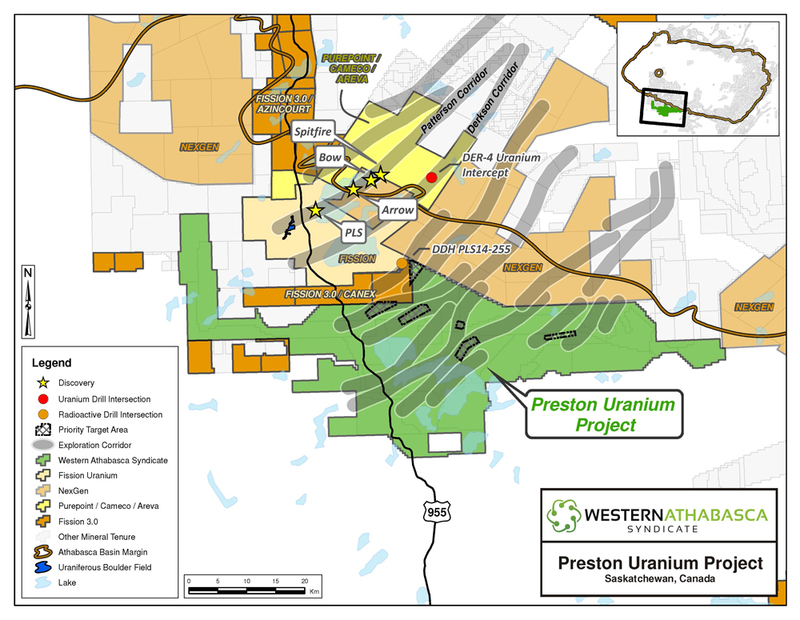 The Preston Uranium Project is a strategic, district-scale tenure position located near NexGen Energy Ltd.’s high grade Arrow deposit hosted on its’ Rook-1 property and Fission Uranium Corp.’s Triple R deposit located within their PLS Project area. The helicopter-borne EM and magnetic geophysical survey will be flown using Geotech Ltd.’s VTEM plus time-domain system at a line spacing of 300m over 300 line kilometers in the north-central region of the Preston project. The survey intends to define the extensions of prospective conductive trends identified during previously completed surveys, similar in nature to those that host the high-grade Triple R and Arrow deposits located less than 25 kilometres to the north. Prior airborne surveys have delineated more than 360 linear kilometres of prospective EM conductors in 6 distinct uranium exploration corridors, out of which less than 10 kilometres have been investigated by widely-spaced diamond drilling. Surveying is anticipated to be completed during the first-half of November. The significant potential of the Western Athabasca Basin is highlighted by recent discoveries in the area by NexGen Energy and Fission Uranium which now rank as some of the highest grade and largest undeveloped uranium deposits in the world. Skyharbour and its partner in the Western Athabasca Syndicate carried out a large regional exploration program in the relatively underexplored south-western side of the Athabasca Basin over the last three years. A total of over $4.7 million in expenditures on the Preston Uranium Project has been incurred including ground gravity, airborne and ground EM and magnetics, radon, soil, silt, biogeochem, lake sediment, and geological mapping surveys, as well as boulder prospecting and exploratory diamond drilling programs. Fifteen high-priority drill target areas associated with six prospective exploration corridors have been successfully delineated through this methodical, multi-phased exploration initiative which has culminated in an extensive, proprietary geological database for the project area. This release includes certain statements that may be deemed to be "forward-looking statements". All statements in this release, other than statements of historical facts, that address events or developments that management of the Company expects, are forward-looking statements. Although management believes the expectations expressed in such forward-looking statements are based on reasonable assumptions, such statements are not guarantees of future performance, and actual results or developments may differ materially from those in the forward-looking statements. The Company undertakes no obligation to update these forward-looking statements if management's beliefs, estimates or opinions, or other factors, should change. Factors that could cause actual results to differ materially from those in forward-looking statements, include market prices, exploration and development successes, continued availability of capital and financing, and general economic, market or business conditions. Please see the public filings of the Company at www.sedar.comfor further information.